A Commodore 64 modell C64G, often with a red power LED instead of a green one, sometimes with brown keyboard instead of a bright keyboard. Game cartridge Super Games, which contains the games Colossus Chess 2.0, Silicon Syborgs, International Football. 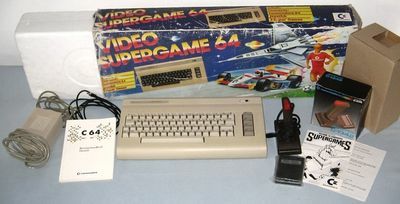 Cardboard package "Video Supergame 64"